I received this question from one of my Facebook Community members via private message. The individual had already been feeling anxious about a new program she’d recently launched because enrolment had been much lower than expected. One of her (very few) program participants had stolen some of the content and was now offering it as their lead magnet or freebie opt-in. It was only by fluke that she came across the copied content too. Seriously?!?! 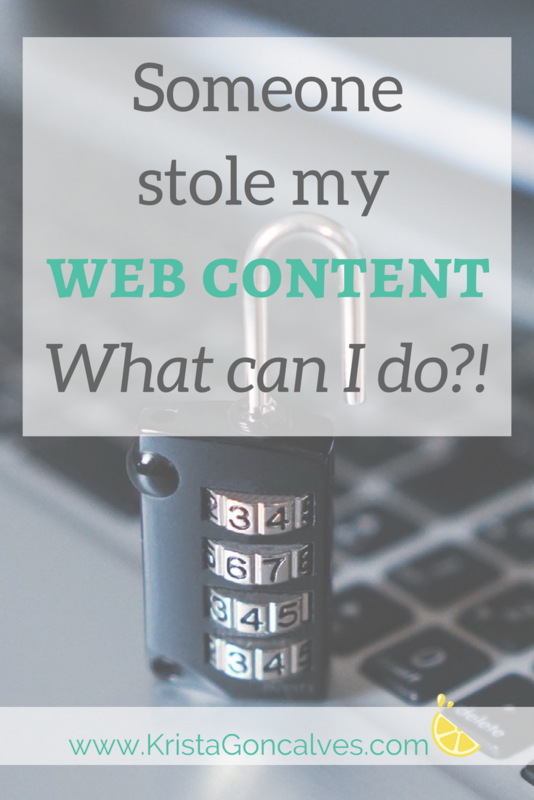 The real threat of stolen web content…if you work online, someone is probably going to steal your sh*t! Unfortunately, this does happen, and often — even in the seemingly trustworthy, feel-good, high-vibin’ Health & Wellness space. Here’s what Copyscape sums up about plagiarism – which is essentially what we’re talking about here. Plagiarism is a serious and growing problem on the Web. Basically, anyone in the world can copy your online content and shamelessly paste it onto their own site. If doing so is not done with the intention of quoting and linking back* to the original content creator (as well as with permission required in many cases), then after making just a few minor changes, they can claim your content as their own. That means there’s a lot of repetitive and regurgitated yuck out there. Publishing stolen or copied work onto your own site can not only lower your credibility, that you’ve likely worked so hard build – but it can ruin your search engine rankings! With just a few easy clicks, anyone can copy your content and republish it on their site, effectively redirecting what should be YOUR website visitors and, in turn, YOUR clients and profits. “If you’re concerned about someone stealing your content, or it’s happened to you before, the first step to take is to make sure you’re protected with some simple legal documents. You should clearly and conspicuously state that your work is protected and that you will pursue your rights to protect it, if necessary. You should also have a clear sharing policy in your terms & conditions on your website. Once you’ve discovered someone has taken your content, pause for a moment to plan a well-thought-out strategy. You’ll want to send a short, yet professional, email or letter to a) let them know you’ve become aware of your content being taken without your permission, b) directing them to take it down/remove it, and c) giving them a specific period of time with which to do so. FYI – I did NOT have any legal documents in place on my website prior to the content theft that I experienced – but I sure do now! If you discover someone has stolen your content, you should act quickly to have it removed. Since copyright laws vary from place to place, it is always best to seek professional legal advice from a qualified lawyer where you live (and work) before proceeding. Look for contact details on the offending site and send a polite message asking for the material to be removed. Use a Whois service to find out the website owner’s name & details, and contact them directly. Enter the domain name in the search box and the contact information should appear towards the bottom of the page. Contact the web hosting company used by the site and inform them of their customer’s abuse. This information is also available through a Whois search. Send a formal ‘Cease & Desist’ letter notifying the offending party that they must remove the stolen content from their site. Krista’s note: various sample letters are available on the web or you can inquire HERE about DIY Legal Templates. File a notice of Digital Millenium Copyright Act (DMCA) infringement with search engines such as Google to have the offending site removed from their search results. Krista’s note: DMCA is a US copyright law, but here’s more about the Canadian version. If you need proof of infringement, you can use the Internet Archive to show that the content appeared on your site at an earlier date than it appeared on the offending site. You can’t hide or fly under the radar on the Web! Trust me, anything can and will be found. If you’ve chosen to conduct your business online, as I have, even partially – the chances are very high that your work will be stolen at least once. So, be sure to protect yourself right from the beginning with all of these great tips from Health & Legal Coach Sam Vander Wielen and Copyscape. On the other side of the coin, do your due diligence in not only creating your own fresh content (or have it created exclusively for you by a content writer *wink, wink*) but also when acquiring content, like if you choose to use “done for you” resources, for example – get it only from reputable sources AND be sure to customize it. I even encourage my web content writing clients to run my work through Copyscape (nothing to hide! ), and I do the same when I’ve received a guest post or when I’m referencing someone else’s work in a post I’ve written – like I’ve done here. Oh, and it should go without saying…don’t BE one of those unoriginal a-holes! It’s fine to emulate others and be inspired by their work, just don’t steal or copy it! Now go get YOUR legal booty covered AND prevent unoriginal a-holes (with no integrity) from stealing your sh*t! Want a whole whack of resources, including some more free legal tips & tools?